As a remodeling contractor, taking dreams and shaping them into reality are part of what we do on a daily basis at Specialty Builders. For 35-plus years, we have provided home interior and commercial remodeling and renovations to the Austin and surrounding area, with kitchen remodeling being our most requested service. 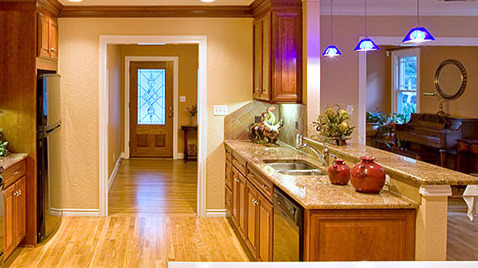 We can help you create a stunning kitchen you will want to share with your family and friends. Our artisans can incorporate the latest appliances, build custom cabinetry and install new tile or wood flooring and countertops of granite or other beautiful solid surface. Anything you imagine can be included in the design such as a wine bar, prep kitchen/project room or even a butler&apos;s pantry. If you are considering bath remodeling, we can build a luxurious space to relax with new colors and cabinetry, a glass-enclosed or custom-tiled shower with multiple or rain showerheads. Or, if you want to add a little fun, we can convert a space into a game room or home theater. Let us help you fall in love with your home all over again! From kitchen and bath remodeling to commercial and office remodeling and make-readies, our experienced team members have been involved with all facets of these projects. The Wiley family has a deep, rich history of involvement with residential and commercial remodeling business. We have an award-winning track record that makes Specialty Builders the right choice whether it is remodeling your home&apos;s interior, kitchen and bath or creating the perfect space for your business. Our quality craftsmanship and attention to detail are foremost--and we still hold fast to our three core values: honesty, responsibility and reliability.